Exceeds expectations with every slice. The NSF 8 revisions are tough. Tough enough to make some manufacturers opt for easier certification routes. But on our new HS Series, you'll find NSF 8 revisions meant to deliver a slicer as well as it protects. In addition to sealed seams, compliant fasteners and removable parts for easy cleaning, you’ll find four patented features for better operation. Proven reliability. The HS Series comes with a ½-HP knife-drive motor, and the automatic versions incorporate a proven belt-drive system to maximize reliability. 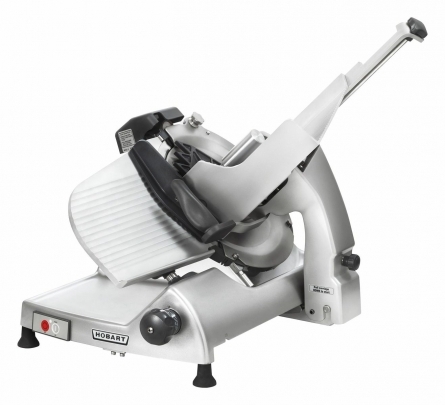 Hobart Service factory-trained technicians are available to help install, maintain and service the new HS Series slicer. Our patented composite knife delivers long-lasting performance. The 13" CleanCut™ knife is a stainless steel knife with a stellite-alloy edge. While lesser knives will dull quickly or pit, ours stays sharp longer, giving you unparalleled precision. Using this alloy, we’re also able to create a thin-edge design, so you get improved yield and reduced cost of ownership. In fact, the CleanCut knife outlasts other knives on the market. Our Borazon® sharpening stones, with a lifetime warranty, ensure it. The sharpener is top mounted on the HS Series slicer and is easy to operate while keeping the knife edge shielded.A great knife isn’t the only thing that yields consistent cuts. The HS Series product tray is designed to enhance the quality of each slice while working together with the removable, rear-mounted, meat-grip assembly to ensure secure product placement. Machined grooves on the gauge plate and knife cover ensure smooth and even strokes, reduced drag, heightened precision and improved slice performance. For added precision, the HS Series automatic models are equipped with three stroke lengths and four stroke speeds to handle a wide variety of products. The automatic models now also come with a seamless fence to secure the product during automatic operation. REMOVABLE FEATURES ALLOW FOR THOROUGH CLEANING AND SANITATION.